If I have to get the xpath or css of this element, either I have to use class or href attributes or similar way. 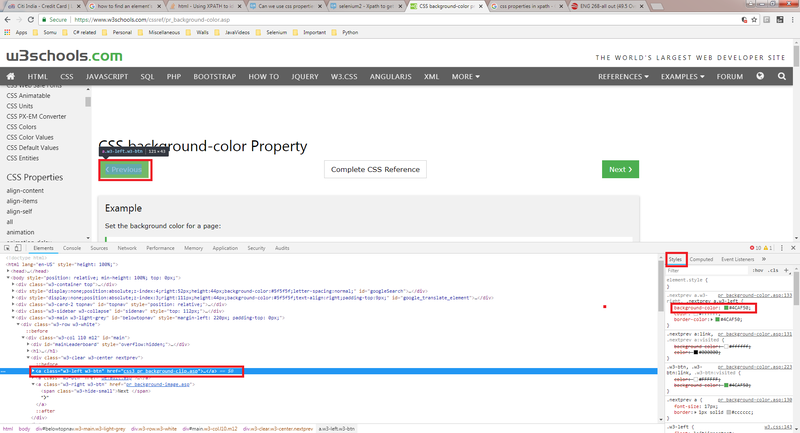 But I want to find it based on the background color, which is not shown anywhere in the attributes but it is seen in the element style. You can reference any combination that renders in the DOM. So in this case the css class and the element type you can reference. As it's a link that likely has multiple associations to the class I would utilize an xquery that includes the parent object and then the a link and class, or the rendered text of the link if that is unique. In general you can't used derived class color information, but only what is rendered in the DOM. The drilled in view of the DOM that you have is what you can utilize to locate elements, if it isn't in there then you can't use it as the screen reader is literally reading the DOM. You can only locate element by style if the element has style attribute inline so that you will be able to use that attribute like you normally do when use attributes in css selectors. Basically css-selectors are originally used to define a scope of elements you want to apply the styles to, not to defined the scope of elements having the particular style. Not the answer you're looking for? Browse other questions tagged selenium-webdriver xpath css-selectors or ask your own question. How to handle regularly changing AUT in webdriver? How to find the CSS style attribute of a particular HTML element using Robot Framework? How do I use a combination of attributes to select a button in Selenium? What makes a good selenium locator? Are SelectById, SelectByClass and SelectByName just special cases of general SelectByTag? How to get src link using Selenium?